The Children’s Aid Foundation of Halton’s Back-to-School drive is on! Remember the feeling of starting the new school year with fun, new supplies? 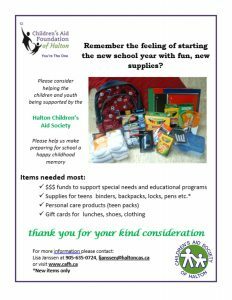 When making purchases for your family, consider a few extra items for the children, youth and families supported by our Society.